Anyone who wears eyeglasses can attest to the fact that there is more than one thing to consider when it comes to finding the perfect pair of glasses. For many people, the first consideration is how they will look in them. That’s because the fashion-conscious world we live in, influences us so much, we feel compelled to buy frames that are designed for the masses. And, sometimes we are so worried about how we look; that we forget our comfort should be just as important. From eyeglass frames that slip down the nose to a fit that is just too tight, we should not have to sacrifice our comfort over style. Because, when it comes to wearing eyeglasses comfort is important. Today, there are so many eyewear brands each offering something unique. But there is only one eyewear brand that offers a completely unique look, Tom Davies. That’s because, it is tailor made for you! 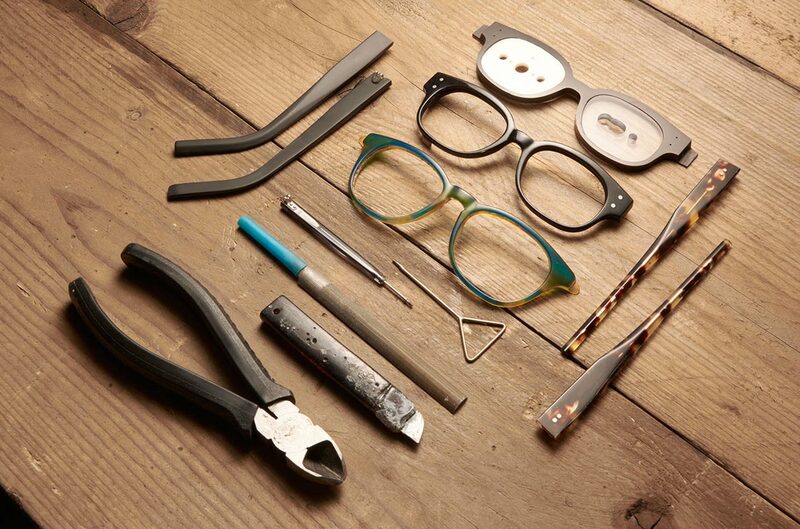 Custom eyeglass frames offer a truly unique, one of a kind, pair of eyeglasses. One that will remain forever, totally unique! From eyeglass frames that slip down the nose to a fit that is just too tight, we should not have to sacrifice our comfort over style. We are all shaped differently, from our head to our toes, and our faces are no different. In fact, we are so different the chances of finding the perfect pair of glasses from the available selection at your optometrist, is very slim. Whether we are looking for a certain style of eyewear or we have a particular color in mind, it can be frustrating when trying to find the right pair of glasses. But, what if there was a frame that fit your unique features, style, and needs? For difficult to fit faces and those who want a truly unique piece of eyewear, Tom Davies Bespoke offers that and so much more. Can you imagine having a frame designed around your natural features? One that fits perfectly to your nose, head shape and ears. A bespoke pair of glasses is a pair which will remain forever, totally unique. Glasses define you, which is why Tom Davies created an eyewear brand that doesn’t force you to compromise style and comfort. Fitted perfectly to the nose, head shape and ears, with specific attention paid to the brow line of each frame, these custom eyeglass frames offer you style and comfort as a pair. Bespoke pronounced (/bəˈspoʊk/) – made to suit your lifestyle, needs, and taste. Attention to detail is evident throughout our entire process. During a Bespoke design consultation, you will be asked about your personal tastes and preferences. And, based upon your answers, we will pick out several frames for you to try on and assess. Once you’ve found your perfect frames, one of our opticians will take a series of photographs and precise measurements of your face, all of which will be submitted to the TD design studio. Next, a master craftsperson, thoroughly trained in the Tom Davies tradition of meticulous production, will devote 12 to 18 hours to creating, assembling, honing, and polishing your bespoke frames to a flawless finish. At your fitting, we will have you take your glasses off to look inside. There, you will find proof that they’ve been custom made to fit you and only you. You’ll know this because carved discretely into the temple arm, is your name. With the ability to customize every aspect of your eyewear, we can now provide you with a truly custom, one of a kind, pair of glasses. Contact us today at (805) 522-7007 to book an eye exam, or to learn more about our Bespoke custom eyewear.